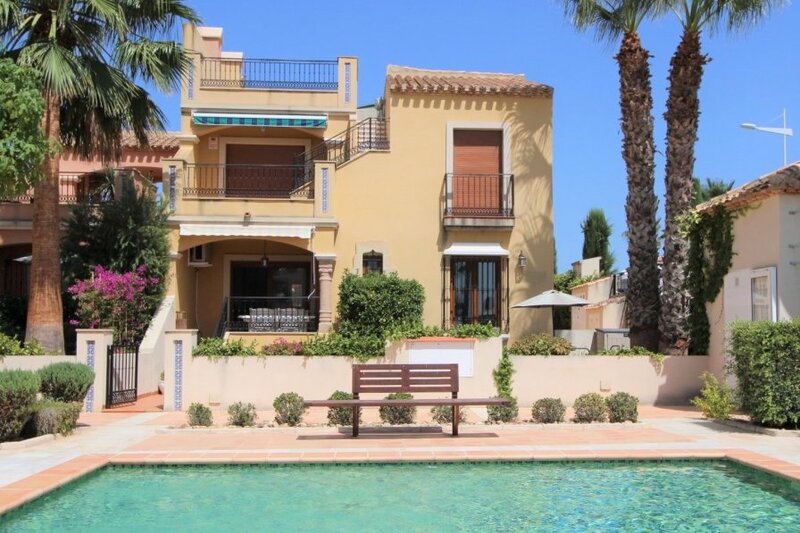 2 bedrooms, 2 bathroom, private garden apartment, La Finca Golf, free WIFI, Poolside location. Located on the prestigious La Finca Golf, our apartment has 2 bedrooms, 2 bathrooms and accommodates up to 4 people. It has recently been decorated and is newly furnished. Set in this enviable location, a very short stroll away from various shops, restaurants and bars, Casa Estrellas is perfect for peaceful relaxation in the quiet tranquility of La Finca Golf. This ground floor apartment with private garden has direct access to the communal pool from the front of the property and also benefits from a further smaller communal pool, accessed via the private rear garden. The fully fitted kitchen has a new fridge/freezer and washing machine, oven, hob, kettle and toaster. The lounge area boasts 2 comfortable sofas, air conditioning, free fibre optic WiFi, smart TV with IPTV, Xbox 360 with games, various board games and books There are sliding patio doors leading to the veranda and private garden. There is one double bedroom with en-suite and one twin bedroom. Both bedrooms are fitted with ceiling fans, have fitted wardrobes and free standing drawer sets. The community has secure parking and is gated. Sorry - Stag or hen parties are not accepted. A 80€ cleaning fee is payable upon arrival to the housekeeper. Please bear in mind the air conditioning is expensive to run. We ask that you keep all windows and external doors closed whilst using the air conditioning. Excessive electricity use will be deducted from the damage deposit if necessary. Please leave our apartment as you find it. Extra cleaning will incur additional fees. All breakages need to be reported to Sarah as soon as possible.